We bookend trips with bourbon. We just always have. Our arrival at Roaring Brook campground in Baxter State Park was unceremoniously late. We spent the morning switching dog-sitters and repacking a cooler that smelled a little weird. We hit our local co-op for food and drink and spent an absurdly long time gassing up the car and icing down our provisions. 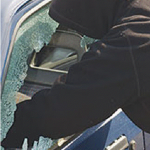 We drove more than six hours and passed a highway accident so brutal the local news media were photographing a spot along the highway median where law enforcement had just dislodged a car from the upper tree branches. The park gate closed at 8:30 pm. We made it in with less than an hour to spare and the couple that would be joining us were running late. Stress levels remained high as we set up our Sierra Designs Lightning 2 tent, laid out the 2018 Zissou 0 degree sleeping bag*, and purchased two bundles of wood, one cedar, one hardwood, for the very reasonable rate of $6. My partner and long time girlfriend, Ren, had just zipped up our cozy little home when the cedar began to catch and crackle. One last set of headlights lit up the entire campground at 8:25pm. The final car to enter for the night contained our friends Barry and Nikki and they were welcomed from all over the campground with raised cans of Pabst Blue Ribbon. I had cleared a spot for our companions’ tent and continued to feed the fire while Ren prepared a nice cheese and meat snack for everybody. Barry and Nikki looked the way we felt as we all sort of stared into the fire from various spots around the picnic table. Barry shuffled off as though he had thought of one more thing to do before he could relax. He returned with a bottle of really nice bourbon and four steel shot glasses. “This is one for sipping, not shots,” he said as he filled our tiny chalices with the ground softener that would prepare us for tomorrow’s climb that nobody in our crew had bothered to research. It was later in the morning than we had intended to wake. I contribute our deep slumber to our tranquil surroundings and certainly not to the bourbon. Roaring brook hums more than it roars. The breezes picked up in the night and cooled the tent from the unseasonably warm 87 degree late September day we had spent on the road. Barry and Nikki prepared a hearty breakfast, Ren filled reservoirs and bottles with fresh water, and I made coffee in one of our many Jetboil stoves. Most of the campground had emptied hours earlier. Fit couples and packs of bearded young men were up at the crack of dawn donning running shorts and filling their furry maws with energy gels and protein bars. Our crew, seasoned, sleepy, deeper into our thirties than the pre-dawn hikers and not quite so passed our youth as the nature photographers, sipped organic coffee, devoured plates of eggs and chicken sausages, and stretched our road-stiffened-spines while the camp stoves hissed on the picnic table. As we ambled toward the Helon Taylor trailhead we checked our watches, 9:50 AM. At two miles per hour or more we had plenty of time to ascend the Helon Taylor Trail, summit Pamola and Chimney Peaks, traverse the Knife Edge, Summit Baxter, cross the Table Lands, descend Saddle Trail, filter water at Chimney Pond, and then saunter back out along the Chimney Pond Trail toward our home at Roaring Brook Campground. -A mere 8.5 mile day. We should be cooking up a camp dinner before5pm, we thought, and oh how wrong we were. The Helon Taylor Trail is great. The climb is fairly steep and some of the bigger boulders along the path require hand and foot work to surmount. Around many of the midway turns are glorious previews of the horizons seen from higher up. There is a moment, perhaps two miles up the 2.7 mile trail, Keep Ridge it’s called, where the uninitiated feel like they may be hitting the crux of the day’s loop. We four suffered our first disappointment here. It was worse than encountering a false summit on a rainy day just as your blisters burst. A breeze had picked up while we climbed, cooling our sweat soaked torsos. In our unhurried excitement we allowed our group to believe we were moving with great sped. Then, .7 miles from the home of the storm god, we were chastised for our arrogance by a rock scramble that seemed to go on forever. Let me be clear when I say there was no section of this adventure that was a breeze. And as we hiked into the night much later on that day and the black flies swarmed behind the lenses of my glasses, getting their tiny bodies smashed by my long eyelashes as I squinted to find the trail in depthless twilight, I longed for the torso-cooling breeze that would no longer stir. Our group spread out according to fitness and determination along the Keep Ridge. Nikki was in front. She is military, an officer, a doctor, she has a gym membership and everything. Her husband Barry is a gym guy too, also a bartender, and possibly the most unflappable human on this earth. He doesn’t complain, he doesn’t get worried, he doesn’t get hangovers, he barely gets full and has never mentioned to me that he was thirsty. I deeply believe the guy should be studied and the ultimate mood stabilizer be harvested from his DNA. I am a seasoned outdoorsman that has balanced along the line between confidence and hubris in my preparation for every big trip. I made a calendar of the month of September. I had days of squats and planks written in on Tuesdays, long bike rides for Sundays, some runs and big paddling days were written in too. You could have filmed a great Rocky workout montage from the plans I had put to paper. By our departure day, September 25, I had checked off three days of workouts culminating in two bike rides and about 4 cumulative minutes of planks. So pretty much I was as ready as ever for three days of paddling and high peak hiking. I knew Ren was ready too because she had been on exactly two big hikes in her life, one backpacking trip less than three weeks before this one, and anyway, she really wanted to come along. 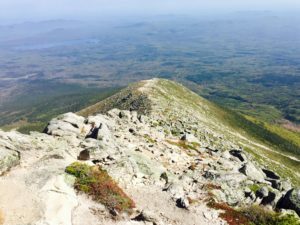 Nikki and Barry sat on top of Pamola Peak, named for a first nations’ storm god who made a home on Katahdin. I made eye contact with them and then followed there simultaneous gazes as they looked out at Chimney and the Knife Edge. I dropped my pack, crestfallen, saying nothing, and then looked over my shoulder to squint into the distance hoping to spot Ren. The end of the Helon Taylor Trail is humbling, this is the view looking back from near the top of Pamola. 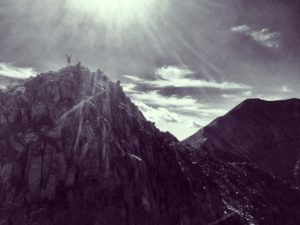 Chimney Peak requires that the hiker descend a cliff off the backside of Pamola, cross a tiny exposed saddle, and then scale an eighty foot rock wall up to the top, only to then look out over the massive stone serrations that make up the one mile Knife Edge. Due to her inexperience, I thought Ren was going to quit and turn around. I prepared Barry and Nikki for this inevitability. I prepared myself to console her and remind her that we could come back next year. I prepared myself to quit. I told myself I would be quitting for Ren, because we were a team, she was my partner, it was the right thing to do. I silently admitted at the very base of my consciousness that I wanted to quit too and Ren would be my out and that everyone would understand, how could they not- I would be a hero. Pamola Peak in the foreground (light stone), then a drop to a small saddle (not shown), then the 80 foot climb up Chimney Peak (dark stone). We always feel pride in our partners when they succeed. Sometimes it’s a graduation, maybe a promotion, perhaps they’ve finally paid off their school loans. We swoon at our engagements, at our weddings, at our anniversaries. Thirtieth birthdays are a big deal I guess. People love to celebrate their first apartment together, their first home. The overwhelming pride I felt toward Ren for being tougher than the three of us seasoned adventurers put together overwhelmed me to the point of tears. Fortunately, the wind was gusting and drying all of our eyes terribly at that time. Nikki and Barry made their way up the side of Chimney Peak without incident while Ren and I stayed behind to take exciting photos that didn’t really come out due to how low the sun was already getting in the sky. Ren went in front of me as we progressed across the tiny saddle. A part of me played with emergency scenarios as I worked out the moves to ascend behind her. If she fell, I could reach out a lightning fast hand, we would grab wrists, and I would grunt as I pulled her to safety. If she fell, she would fall into me and as we both came off we would look into each other’s eyes before landing safely into a graceful roll at the base of the soft saddle. As I reached up and around a big overhang I would feel a handhold and swing out for footing, trusting my strength. Lauren would be hanging from a hold way above her head, toes clawing at the smooth stone. Panicking she would ask me to help, but my hands and feet would be occupied supporting my own weight. “Step up,” I would yell, “feel with your feet.” She would be kicking pebbles and sand down into my eyes. “You’ve almost got it, feel with your toes, concentrate!” And then she would have it and step up and we would get safe. In my deep physical focus and while my mind rambled around all of these action movie scenarios Lauren had topped out and was looking along the Knife Edge and I was standing next to her. She turned to me and held my hand, “That wasn’t so bad, wanna go first this time?” And off we went, crossing the dozens of serrations that made up the one mile trail to the summit of Mt. Katahdin. Serrations of the Knife Edge seen from other serrations along the Knife Edge. As children we have all walked along the road, opting to free ourselves from the secure grasp of a parent’s hand, choosing instead to walk the narrow edge of the curb. One foot in front of the other, achieving a balance beyond that which we thought we were capable. Along the knife edge, bearing the full burden of supplies and the unyielding weight of a day’s worth of water, the stakes were raised significantly. So many times did each of us feel like the child again. A gust of wind, a loose stone, and quickly to our hands did we compress down into a crouch. Fearful to engage the core and stand erect again, we would move hand, hand, foot, foot, a few primate steps until the rare flat surface presented itself, an ever-distant safe spot for rest and a swig of water. If I caught a backward glance from Barry or Nikki I felt compelled to wave or pump a fist in the air, no worries, full confidence. Occasionally my body and mind would unite in a deep zen-like focus. I would forget the sharp drop off of the cliffs to either side of me and move with grace and style. A leap, touching down with my dominant foot, feeling the power build in my flexed quadricep as it absorbed the impact and then another leap. My left foot would contact the stone just as I had planned and before all the gear had a chance to settle back down to the bottom of my pack I would jump again, a hand would clap a perfect hold and my rear foot would join the other and I would look up and around at nobody, momentarily beaming with pride at the acrobatics I had just performed. Then a gust of wind would leave me panicked and desperately dropping my center of gravity to regain a sense of control. I moved this way for almost two hours across a single mile of trail while a moose bugled below. 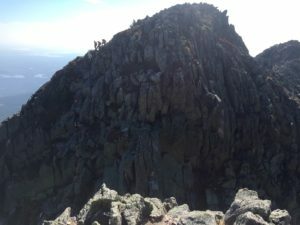 The summit of Katahdin, 5,267 foot Baxter Peak, was not unknown to me. 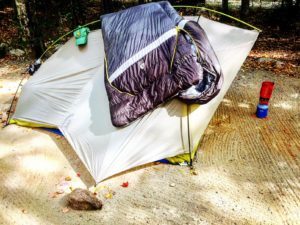 Social media has presented the avid outdoors person thousands of opportunities to look upon smiling faces, triumphant in the completion of their Northbound Appalachian Trail hike. The sign looks just as it does in all those photos, maybe slightly smaller. The giant rock cairn beside it is perfect to pose up against, a manmade mound of stone on a mountain of rock, a monument to bipedal achievement. 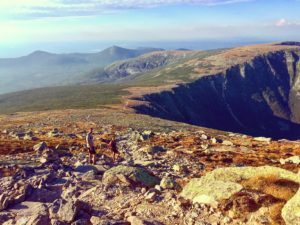 But nobody ever posts a photo showing the onset of exhaustion as the revelry dissipates and the realization of the long slogging descent back to camp washes over the face of every Katahdin climber. The Table Lands are gorgeous in a Tolkien sort of way. I am surprised that Weiss and Benioff haven’t filmed some scene of magic and brutality for their show Game Of Thrones on their green expanses. The spill over that is Saddle Trail stymies the most experienced park visitor. 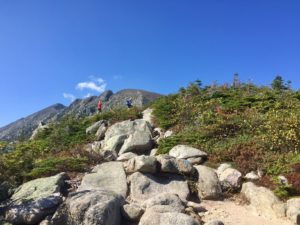 I remember wondering how the Maine State Park Service could trust exhausted hikers to travel down a trail that was really just a mix of scree and talus slowly sliding down a sandy drainage. The expansive Table Lands take hikers to the dark drop off at the center of the image where we found the Saddle Trail. The trail grew easier as we approached Chimney Pond. Though out of water and with the sun setting behind Baxter Peak we experienced a sort of half-happy feeling. Yes, we had been looking down at Chimney Pond from the many sections of Mt. Katahdin all day. We longed to feel the triumph that would surely overcome us as soon as we dipped our bruised feet in her cool waters. But now it was twilight, our mouths were sandpaper, made rougher not just from heavy exertion but from the exchange of reassuring cheers that we optimistically shared for the past five hours. The sign reading no swimming, no wading was a sharp kick to our morale. Then, my Sawyer Squeeze filter malfunctioned, and Barry and Nikki realized that neither of them had brought theirs at all. 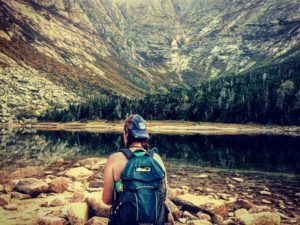 We drank the water unfiltered, filled our bottles and reservoirs, then made obligatory small talk with a ranger and some folks heading to Crawford Notch in the White Mountains. They asked what they could expect, we told them, and we made our way into the darkness with headlamps lighting our path. Ren at Chimney Pond as the sun sets behind Mt. Katahdin. A funny thing happens when everybody in the lead is experienced, proficient at reading a map, and eager for the day’s hardship to end. We all just started agreeing that we had traveled 1.5 miles when we had traveled only .3. We assured each other that it would be another hour before we could remove our boots and devour all the food that remained in our coolers. Nikki and I said that we had arrived at Roaring Brook and that camp was just around the corner at least five times before the unflappable Barry calmly interjected, “There is probably more then one brook that sounds like it is roaring in Baxter State Park.” We just nodded silently and kept on leaping from large stone to large stone as that was the way of the trail. Every so often we would encounter huge bridges across small streams. Each plank of the bridge must have been eight feet long and eight inches wide, each board milled from trees in the park, their grain patterns glowed by the light of our lamps. The ruggedness of their construction only amplified the remoteness of our trail and the mediocrity of our progress. When we arrived at the sign reading Roaring Brook .2 miles the concussive force of our high fives should have awoken the campground and sent rangers rushing toward the manic sounds of our wild jubilation. Instead we unceremoniously strolled up to the sign in, documented that we had returned, and silently made our way to campsite 25. We each went through our own coming-down ceremony. I removed my boots and stared at the first blisters I had endured in a decade. Ren pulled out the Sierra Designs Zissou 0 and lay flat on her back and I swear I saw her smiling up at the stars. Nikki, ever energetic and a consummate professional got to work on dinner for the four of us. Barry produced a small leather sleeve containing four steel shot glasses, filled each one, and calmly, gently coaxed us to the picnic table. Our trip ended as it had begun, with bourbon. -Warm sleepers will love the foot-flap that allows for easy ventilation in the night without messing with zippers. I have a tent-mate-horrifying-habit of fighting my way out of my sleeping bag late at night to engage in some ninja-yoga moves in an effort to remove my base layers and socks. With the foot opening I was able to hike the sleeping bag up like Steve Urkel’s pants, allowing me full access to my base layer bottoms and socks requiring only the gentlest backbend during removal. Double Bonus: My shed layers were not trapped at the foot of my bag all night long! 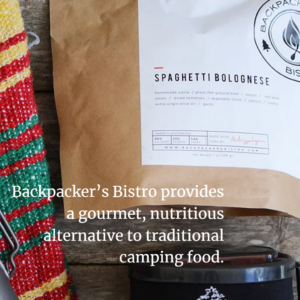 -The “integrated comforter” involves a second zipper opposite the main zipper that allows the whole front of the bag to open to the chest for a more natural blanket-feeling. The evenings were quite warm at Roaring Brook and utilizing this option made for better rest than I could have achieved with a traditional mummy bag. -We experienced a microburst styled deluge on our last night (only moments after another round of celebratory bourbon came out). Our tents were staked and guyed perfectly, locations selected with care, but the sheer volume of water was so great and came on so fast it moved across the surface of the ground like a liquid sheet. For thirty harrowing minutes water flowed over our tent’s foot print and under our tent’s floor. 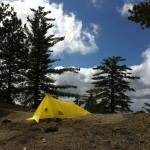 The Lightning 2 took it like a champ and our bags and pads only suffered minor saturation. 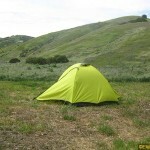 The best part about the Zissou 0 was that it was dry and comfortable by morning. -For fifteen years as an outdoor writer, I have limited my comments on aesthetics to natural sights and the way people look more healthy and attractive by firelight, well that all ends today. The overall styling of the new Dridown Zissou 0 is awesome. The interior boasts a sort of graph of the high points around the US and it’s two-toned gray made for a nice contrast to the brighter exterior thereby helping the user to know inside from outside, head from foot. 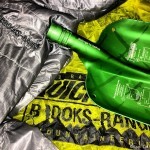 -To conclude, not only would I give this sleeping bag a five-star rating and recommend it to a friend based both on its performance and its affordability, but I fully intend to acquire a colder weather version of the same bag for several upcoming multi-day trips into New Hampshire’s Presidential Range this winter. Keating is a life long outdoorsman. 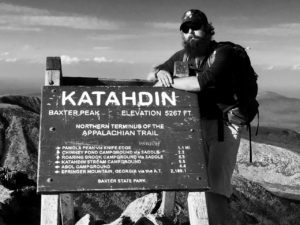 He has taught Wilderness Literature courses at colleges in Arizona, trained individuals of all walks of life in tracking and backcountry skills, and lead multi-day trips in Yosemite and Grand Canyon National Parks. 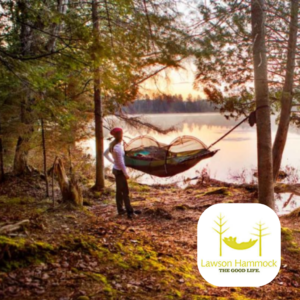 He lives in New Hampshire’s North Country and is a freelance writer and wilderness interpreter.